Fetch.ai is a project of venture capital firm Outlier Ventures, that is managed by CEO Jamie Burke, that is also one of the project’s advisors. In March of 2018, Outlier Ventures announced its newest venture, Fetch AI. At the time it had been in stealth mode for 14 months. The core team has been working on the project for two years now. – Fetch is a founding partner of the Blockchain for Europe association. Other members are Ripple, NEM and the Cardano Foundation. The goal of the partnership is to foster the understanding of upcoming regulations in the DLT and blockchain industry in Europe. – UK-based, online sharing platform for scientists, Clustermarket, engaged in a transformational scientific equipment venture with Fetch. 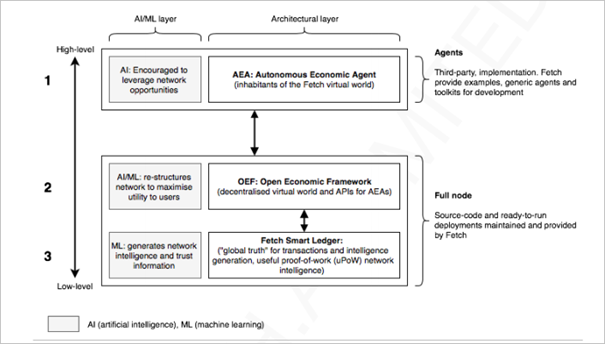 Clustermarket will be one of the first platforms to deploy autonomous economic agents and thus demonstrate a primary use of the network, maximizing the value of the asset. According to CrunchBase, Clustermarket has raised 250,000 GBP in two previous funding rounds. The company is comprised of four employees. – Other partners include: Mobility Open Blockchain Initiative, MOBI, Warwick Business School (WBS), TokenMarket and ULedger. 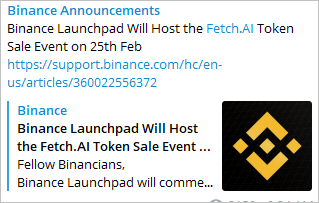 Fetch started their private sale in April of 2018. During a time that the investor’s interest in ICOs was quickly decreasing. 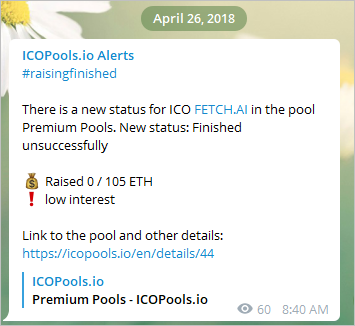 A lot of ICO pools offered Fetch on their platform. 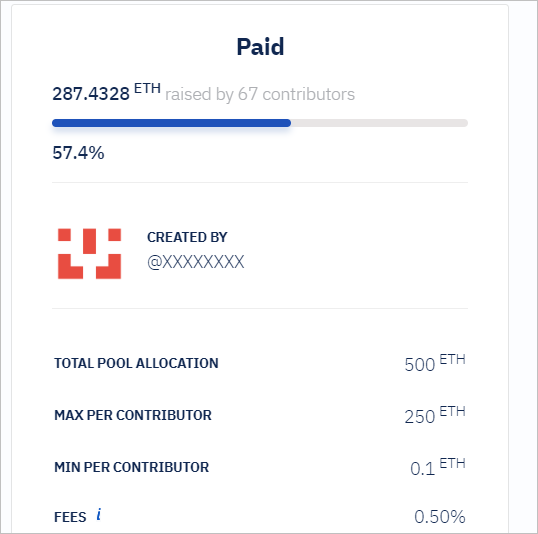 Many pools did not succeed in raising the allocated amount in ETH, due to bearish market conditions and a lack of interest in investing in an ICO. 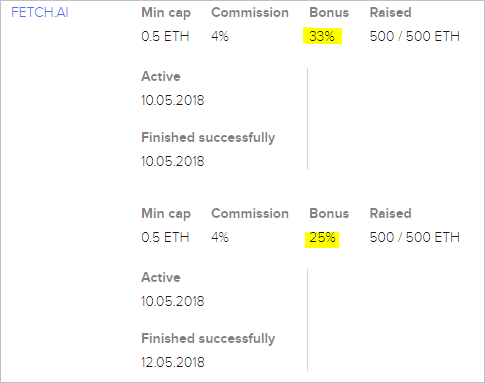 Participation capital managed to raise 1,000 ETH in exchange for FET, at a 33% and 25% bonus. — This ICO has been in execution phase for almost a year, first private sale, soon to be public sale. Private sale investors have a lockup and a bonus of 33% or 25%. 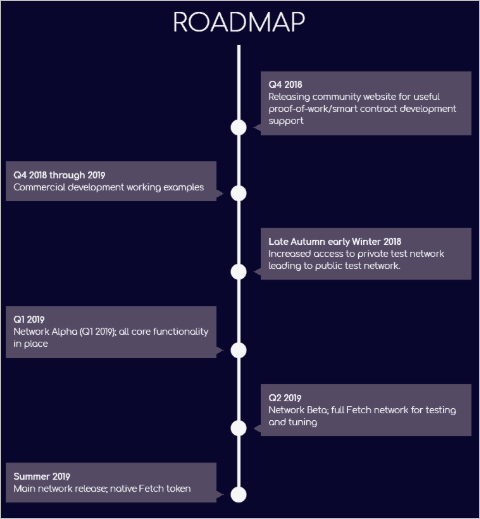 — The private sale didn’t attract many investors, the team is about six months behind on their initial roadmap, mainnet is planned for EOY. In the meantime other than exchange listings and partnerships probably not much news. — The project might run out of funds soon if the token becomes illiquid or doesn’t raise additional funds, as 85% of private sale SAFT funds have already been converted into fiat currency (approximately $3.5 million). A large staff that needs to be paid, estimated burn rate between $200k and $500k a month. — Only 20% of the total tokens will be offered in the token sale, 11.62% in the private sale (locked), which leaves 8.38% for the public sale. Fully diluted, the market cap is too high for an ICO that has no liability to its investors. Also check my BlockDelta profile for additional articles.